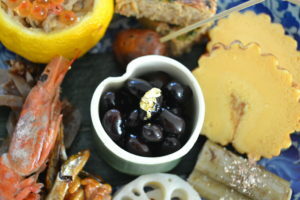 Today, I will introduce you to the Japanese traditional new year dishes “Osechi Ryori” in series starting from today. 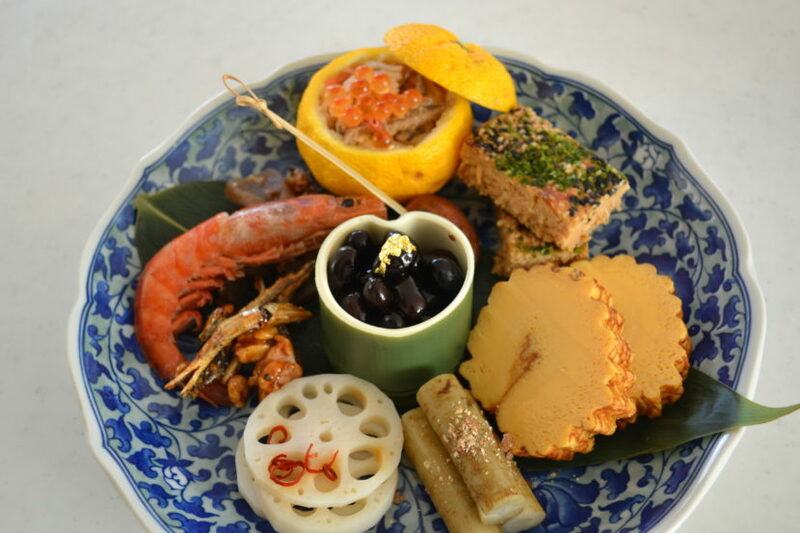 There are so many Osechi Ryori in Japan, and each has a hidden meaning. In these days, not so many people make Osechi from scratch at home. It’s such a time-consuming job! We are too busy to make so many kinds of dishes at the end of the year. If you go to old school way, it’s going to take 3 days to complete the whole Osechi. If you take my way, it will take 3 to 4 hours (except kuromame) from start to finish. And yet you can buy Osechi at any supermarket or famous restaurant. The prices are in a range of 10,000 yen to 100,000 at the high end. The Osechi dishes are relatively seasoned strong to keep longer than usual dishes. The first 3 day of the new year is holidays for Japanese house-wives. Thanks for the well-keep Osechi, house-wives don’t need to make every meals as usual. 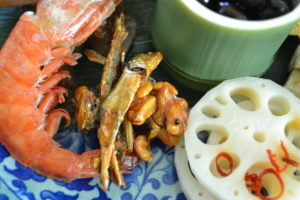 The tastes vary by regions or by households. I think my taste is not too strong, not too plain but just good! I think you will like it too! First, let’s make the easiest one. This is called “Tadukuri” candied dried baby sardine. Ta=rice paddy, zukuri=create. In the old days, we used dried sardine as a fertilizer for rice paddy to get more harvest. We still live on rice so we prepare “Tazukuri” to wish great harvest for the next year. I always add roasted walnut to make it even better. 1. Line sardines on a microwave-safe dish. Make a space in the center. Microwave it for 50 seconds on 600w. It becomes really dry and crunchy when it comes to room temperature. 2. Put sugar, mirin and soy sauce into a frying pan and heat on a medium heat. Reduce to a sticky syrup like texture. 3. Add microwave-dried sardine and diced walnuts. Stir to coat evenly. Transfer to a parchment lined tray and let it cool. This will last for quite long, so that you can make it earlier than any other dishes. The second dish is “Subasu” vinegared Lotus root. This will last for a week so you can make ahead of the new year. Lotus represents purity, as it’s growing in mud but still bloom brilliantly the root is so white. 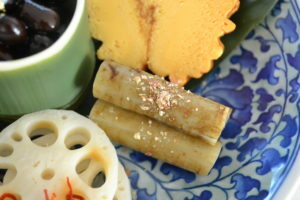 Lotus root is considered as strengthen your ability to forecast the future. Why? You can see through the future from the holes. 1. 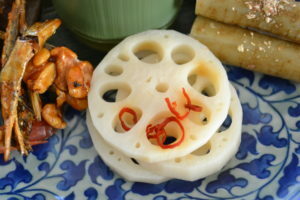 Peel lotus root and slice into 5 mm(1/5 inch) thick. Soak in cold water right after cutting to prevent from darkening. 2. Bring Sushi vinegar and sugar to a boil and add lotus root. Cover the lid and cook for 2 to 3 minutes or until look translucent. Check my previous video how to make sushi vinegar. 3. Transfer to a container to stop cooking and sprinkle sliced dried chili pepper. Put a piece of plastic wrap directly on top to season well. The next dish is “Tataki-gobo” literally means smashed burdock root. Burdock root is a slender root vegetable which grows deep down into the soil. It represents a strength and persistence. If you want to be more patient, eat this! 1. Brush burdock roots under running water. The skin is very thin so you can peel off with a vegetable brush. 2. Cut into the size of your pot. Pour water to cover and add sugar and vinegar. Cook over medium heat with a lid on for 20 to 30 minutes according to the diameter of your burdock root. 3. When you stick the toothpick easily, take out from the pot. 4. Smash your burdock roots to soften the fiber. Do not smash too strong, it have to holds its shape. Cut into 5 cm(=2 inches) and transfer to a container. Pour over sushi vinegar. Cover with plastic wrap directly onto the surface to season well. This is a hard vegetable to eat so you can get a physical persistance when you eat this in anyways! You can’t skip “Kuromame” the sweetened Japanese black beans. If you want a prosperity in your life, you have to work harder than anybody else. That’s why I think the black bean is the most important in osechi dishes. This is my way of making black beans. I cook the black beans quite often for my pastry shop, so trust me that this is the most effective way to cook. 1.First, wash and clean the black beans. These are the product of our town, having the best quality. 2.Put them in my pressure cooker and add half a teaspoon of baking soda, and salt. When we cook kuromame, we put the iron eggplant into the pot. Anthocyanin containing black bean skin react to iron, and blacken the skin. If you don’t have it, just skip it. Pour over boiling water and put the lid on. Leave it overnight to rehydrate. 4. The next day, it becomes triple in volume by soaking water. Turn on the heat and bring it to a boil. Remove the froth, and put the lid on. When the weight starts to whistle, cook for 5 minutes. My antique pressure cooker cooks beans perfectly only in 5 minutes, but yours may take longer so adjust the time. Leave it until the pressure releases. If the beans easily smash with your finger, it’s done. 5. Add sugar and cook for 5 minutes. Leave it until cool. When it comes to room temperature, transfer to a container and keep refrigerated. It will last for a week. If you want to keep it longer, add booze to it like rum or bourbon. OK, that’s it for today. We made, tadukuri, subasu, tataki gobo and kuromame. See you in part 2 !